Modern mountain style decor along with a cozy wood fireplace will put your family right at ease each day for your apres moments or pre-activity breakfast take-offs! Two bedroom - two bath, open plan with one level comfort living concept offer all the conveniences of home right here. Kitchen fully equipped with breakfast bar, dining table for 6, along with BBQ on the spacious outdoor patio is perfect for your meals at home. Dishwasher, microwave, full fridge and stove and all the convenience of small appliances at your disposal. 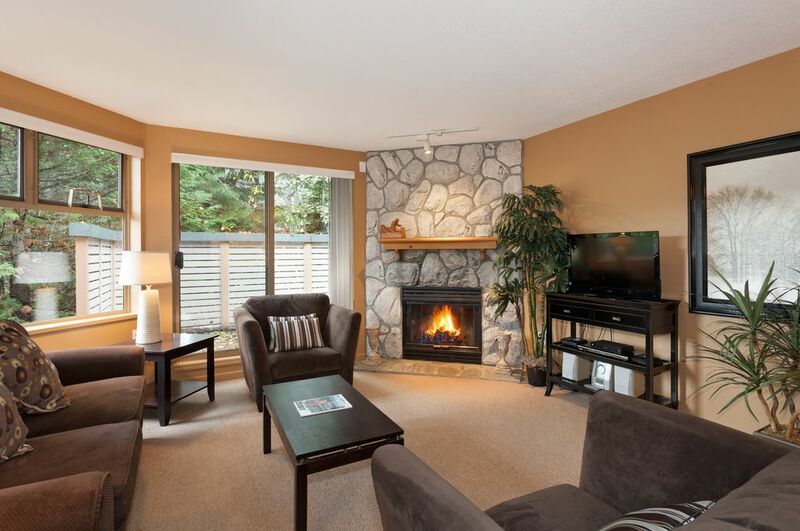 Generous living area comfortably furnished with modern flat screen TV, free wifi and DVD player opens to the patio. The wood fireplace tops off the space with a cozy spot for every evening you stay in! Your family or group will enjoy the flexible bedding situation with superior linens and mattresses. You have your choice of either two kings, four singles or one king and two singles! Pull out sofabed in living area provides for additional sleeping capacity for your growing family. Washer/dryer in townhome, good entry for equipment storage. Gillian was a great host. Description was accurate. Townhome includes washer/dryer. Fully equipped kitchen, with updated appliances. Includes a gas grill on patio worked well. For our 12 day stay we cooked most meals there. Very clean. 1-2 block wall to free shuttle bus to mountain gondolas. Location was very quiet. Great house, great time. The only problem we had was with the location. At the website it showed 2 differents adresses. One much closer to the village. This is a lovely, quiet property, well positioned near the bus stop for the bottom of the Gondolas. There's underground parking included, and a very helpful property management agent, Gillian. We've been there twice and this place is perfect. Clean and 1-2 mintutws drive from blackomb. A bus stop is just beside the condo if you don't have a car. Definitly a good choice.